If you haven’t come across a scribe before, then we hope this will provide insight into how an Innovation Arts graphic facilitator works. If you have seen our work at an event or a conference, this might answer some of the questions we are often asked about this fascinating and vibrant discipline. The primary function of scribing is to visually capture a conversation into a clearer and more digestible form. The visual map of a discussion aids those present by providing visual interest and capturing the flow of ideas, so the participants can see what they are saying. It works afterward to help those who weren’t there access the overall themes and shape of the session. Visual capture brings the messaging to life and makes it more approachable and memorable, particularly to those who employ a more “right-brained” way of learning. A mixture of iconography, graphic forms and metaphors instantly bring meaning to the words, and visualizing complex messaging and strategic thinking also helps to align people in a way that simply talking can’t. This is most useful when graphic facilitation is employed to capture a group discussion as it breaks down the barriers of language and terminology, different levels of understanding and engagement. Ultimately, we know through research that people are most susceptible to learning when they are in a “childlike” state, and the playful medium of drawing stimulates this, enabling the audience to access their collective inner child. It’s the first day of a three-day conference so it’s an early start. I wear comfortable shoes and do a few stretches to ensure I’ll be ready to spend the whole day on my feet. I have a healthy breakfast and check my emails on the way into work. Among the messages in my inbox is a client request to graphically capture their wedding (this is not the first wedding I have scribed)! The three-day conference I’m headed to today is located in central London and involves the construction sector, a sector I am familiar with because our team has had a lot of experience across a wide range of disciplines. We have scribed everything from child soldier experiences and talks about music in schools, to economic conferences outlining the latest trends in the industry, business strategy collaborative decision-making events where the content is being created as it is being scribed. 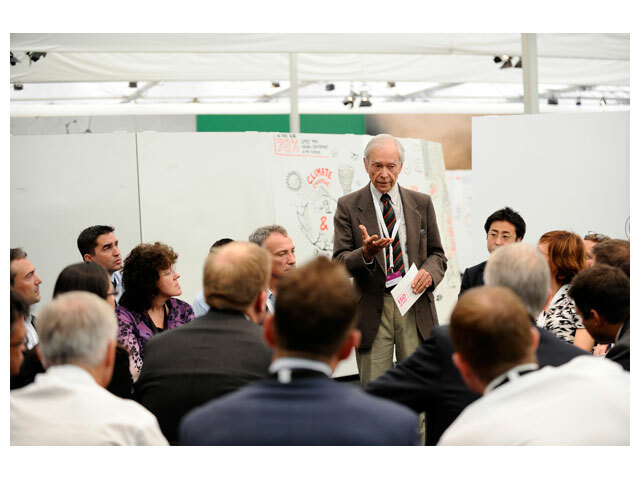 Besides large media events such as TED Global or Wired’s annual Innovation Lectures, we have also scribed private and public events ranging from business leadership away days to global banking summits. Ultimately, the nature of the content makes no difference, because no matter what it is being discussed, we are experts in listening, understanding, and presenting the messaging in a way that everyone can understand and be excited by. That is why scribing is such a powerful tool. There are many different reasons for using graphic facilitation, and many different contexts in which it can be employed. Primarily, scribing is a tool to break down the complexity of strategic conversations. The visual content acts as a record of that moment in time, which could afterward be used as a piece of communications for a larger audience who were not present at the event. Sometimes, the scribing will be developed into an infographic, an annotated illustration (what we call a “rich picture”), animations, storyboards, etc. 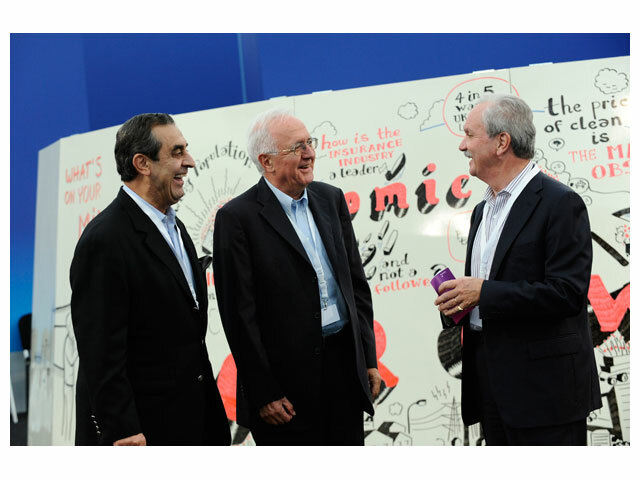 Our scribing lives on in large murals at the London Transport Museum, and the offices of News UK, and Microsoft. In preparation for the construction event today, we have spent the past few days speaking with the client about their agenda, speakers and content, and getting a feel for the images and metaphors that will both reflect the intent of the discussions and resonate with the audience. We also research the speakers, their style and presentations so that we are comfortable with the content once the session is underway. 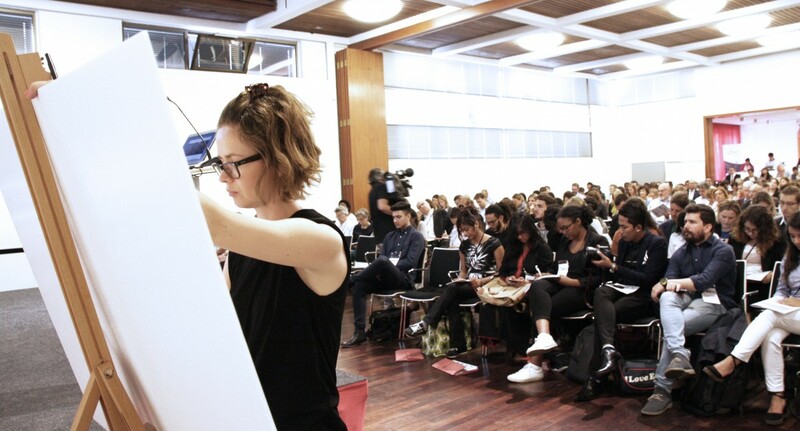 Sometimes, a shorter event conference will only allow a brief research period, but however much time we are given is enough, as the real art of scribing comes from listening and making connections between the different discussion points to track the conversation. For clients who want to achieve a specific outcome or output, we will spend a much greater period of time in preparation to ensure we can help them achieve their objectives. I arrive at the venue around two hours before the session begins to prepare the area where the scribing will take place. This time it’s a large ballroom including a stage and seating for 1,000 people. I will be scribing on my favorite medium, a white board system called MovingWalls, portable, erasable white work walls on wheels, which are easy to transport and link together to make a wall several meters in length. My tool of choice is a whiteboard marker, and I tend to carry an array of different types to ensure I’ve got a good supply for the entire job. The Innovation Arts style is usually monochrome, but it depends on what is right for the session. We are often asked, “How do we scribe? Is it difficult to listen, capture the information, and then turn it into an illustrated InfoMural with the key messages? How are you always so sharp with the content?” The only way I can explain is that it is a craft you learn and perfect over time. Although I have done a lot of preparation for every scribe I’ve done, just before the presenter starts my mind stills and I listen carefully to her speech. As an avid rock climber, I used to jump off cliffs for fun—to do this successfully, you can’t walk up to the edge of a cliff and over-think it, you need to empty your mind and take the leap. That’s similar to how I approach the start of every scribing job. Sessions vary, and if it’s a complex one there will be new information delivered every few seconds. It’s an intense experience, and scribes try to simplify the content by drawing from the mental image bank each of us cultivates, working from muscle memory. The strongest image that links to the information will shoot to the front of my mind, and I commit that to the board. It’s difficult to explain how any creative process happens, but experience, creativity and imagination have helped me and our team of scribes build up a vast bank of visuals in our heads, so we know we can draw the right picture, quickly. The theme of the conference provides me with a nice frame for the InfoMural on which I hang the content, in this case the journey of the event. Metaphors help to clarify the content and add visual interest, and can come from anywhere, from a carefully considered likeness, or a sponsor’s recent safari holiday, to a nearby magazine illustration which, once contemplated, seems wonderfully right for the situation. At the end of the day, with the InfoMural a third of the way completed, I meet up with the client sponsors for a debrief to chat about the outcomes of the day and prepare for the next day’s session. It’s important that the space on the InfoMural is planned in my mind so I leave enough room for all the speakers throughout the event, and for more ideas and connections to emerge as the content develops. The final task of the day is to take a call from an American client who wants Innovation Arts to come to Atlanta to scribe their large international conference. We talk about the event and their expectations and arrange a Skype call for early next week. I get home and decompress with a family dinner, and a quick run with the dog. The next day I will do this all over again—what a great job! Innovation Arts is a hybrid strategy consultancy and design agency. Innovation Arts brings a fresh and highly effective approach to stimulating ‘group genius’ through design practices that stretch people’s thinking and initiate ideas. Described by GQ as the ‘management consultant of the future’, the Innovation Arts team is a mixture of strategists, management consultants, designers, advertisers, branding and communications experts and artists, all skilled in helping organisations make change happen. It’s a unique blend that helps an organisation think differently about the challenges it’s facing, as well as address them. Based on their experience of working repeatedly with some of the leading FTSE100 and Fortune 100 companies, governments and civil society organisations, their clients engage them because they deliver systemic, high-quality, sustainable outcomes with less risk, more certainty and in a fraction of the time compared to conventional approaches. Multiple academic studies have shown that between 50% and 55% of your working day is spent listening, yet only 2% of people have been trained in how to listen. Trimboli states that for the most part, the average person listens to reply and not to understand. Of course, that is far from the truth for a graphic recorder or scribe. At Innovation Arts, we spend most of our time working hard to listen deeply – engaging with content in it’s spoken form so that we can properly translate into into visual metaphors. This requires a lot of training and practice on the part of our graphic recorders. When Trimboli contacted us to find out more about how graphic recorders hone and utilise their deep listening skills, we were happy to share as much as we could. Sarah Manley and David Christie sat down with him to talk “listening to content” through the lens of scribing. Good listening, for a graphic recorder, filters content into the essential – bringing the meaning of a conversation to the service and preserving it in visual form. We really enjoyed being part of the recording of this podcast, and reflecting on our own methods and process with Trimboli. If you are interested in the podcast and learning more about graphic recording please have a listen! 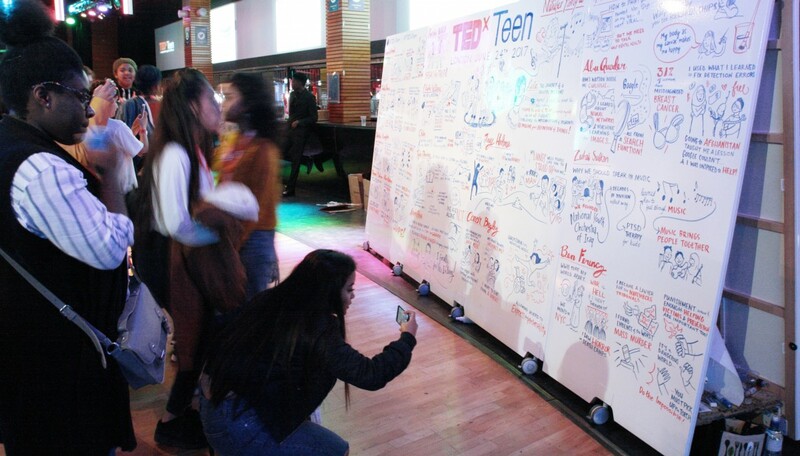 When you are called in to work on a Saturday, it’s lovely when it doesn’t actually feel like work – luckily, TEDxTEEN can be depended upon for fun, excitement, and inspiration. 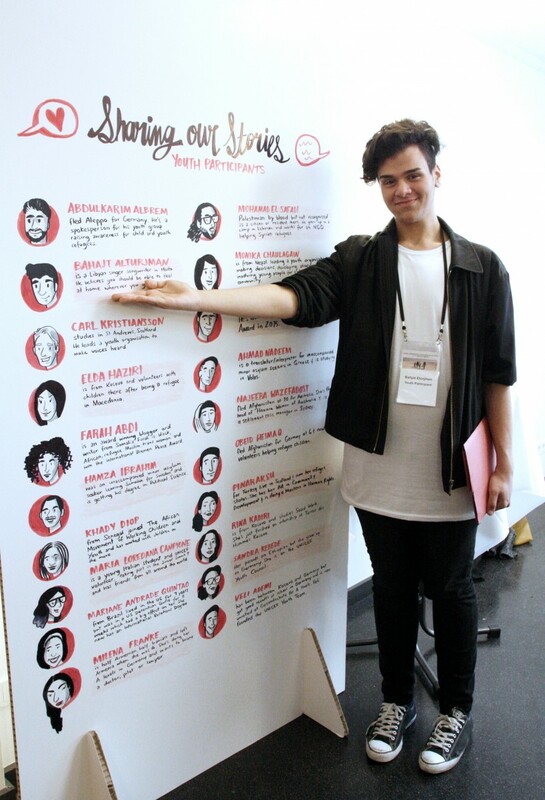 So, Saturday June 24th, our scribes happily travelled down to the 02 – coffees in hand – to capture the rich, diverse and always impressive stories of TEDxTEEN London 2017 as an Infomural. Accordingly, there was a serious but hopeful tone to the talks. We heard from youth grappling with prejudice, mental illness, isolation and death – sharing stories of what it means to be a teen, maturing and learning to cope with realities from which we are sheltered as children. Each one of the speakers had a positive strategy for dealing with personal and global pain. We heard from a young Syrian refugee who, despite odds and parental hair-tearing, managed to carry her school books across borders to ensure her education. We heard from a young girl, mercilessly bullied and abused, who had channelled her experience into the creation of an app that allowed other isolated youth to find peers to sit with at lunchtime. We heard from a self-taught computer-scientist who’s personal experience in Afghanistan inspired him to create artificial intelligence for improved breast cancer detection. It was only fitting then the day should conclude with a voice from the past: Ben Ferencz, the last surviving prosecutor from the Nuremburg Tribunals, joined via skype to share his experiences, fears and hopes for the future. He addressed his audience directly and with respect, speaking to them not as children but as bourgeoning adults about to take on a world of responsibility. Ferencz metaphor of passing on the torch of humanity and progress to this new generation had a clear impact. From the speakers we had the pleasure of listening to that day, we can think of no better a group of young people to rise to the challenge Ferencz’s described. Keeping positive can prove challenging when a scroll through your newsfeed submerges you in painful stories of suffering abroad and at home. At Innovation Arts we are given the unique opportunity to collaborate with organisations that refresh the narrative – writing empowering and hopeful stories through hard work. Save the Children is one such organisation, striving to improve the lives of children all over the world. Their 2017 Global Conference on Children on the Move was a chance to focus on the needs of children migrating between countries. 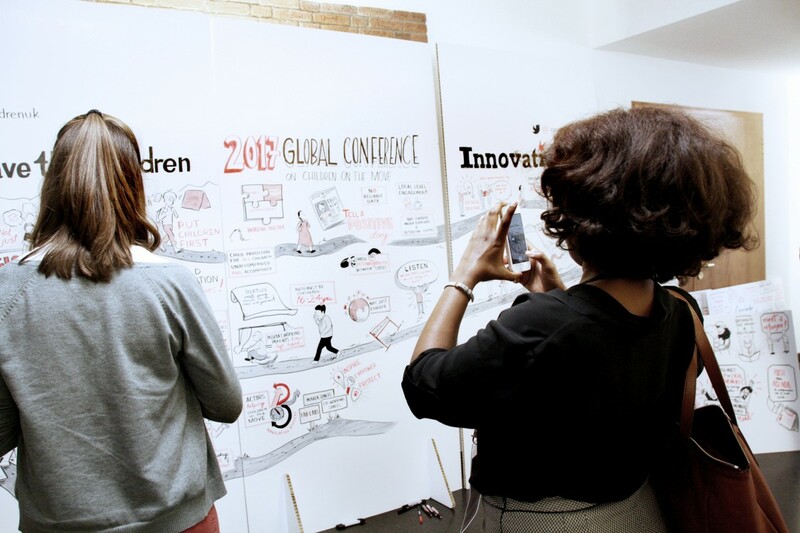 We were honoured to join them on June 12 and 13th in Berlin to capture the event’s output through graphic recording. Participants congregated to share research, explain current initiatives and ideate new solutions for the needs of children on the move as well as means of prevention against the many risks these children face. Among participants were humanitarian organisations like UNICEF, government representatives, the United Nations, intergovernmental agencies, universities, private sector companies, Save the Children’s many international offices, and many more. Photo: Participants congregate around our infomural and graphic recording to reflect upon output from the day. It was inspiring to see the spirit of collaboration and collective action that permeated the event. 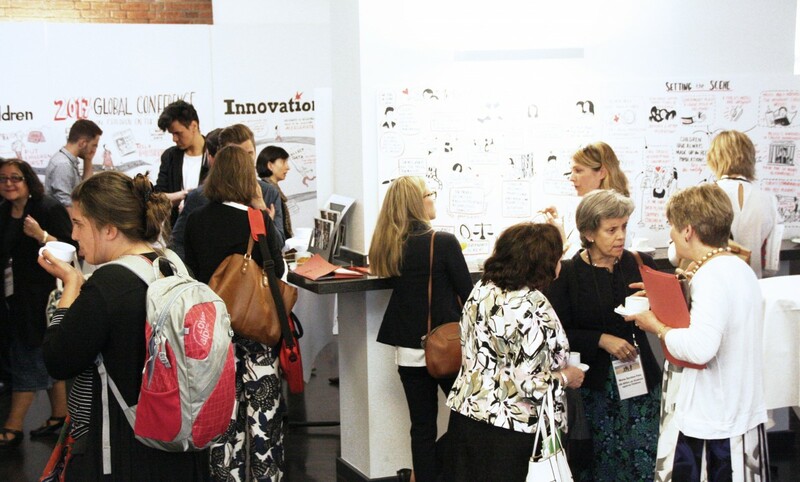 There was incredible energy as attendees shared their work, ideas and passion for change. We were asked to graphic record throughout the day, capturing output from talks and workshops. The graphic recording was galleried in the main hall so attendees reflect upon the content from the day, and discuss plans for future action. 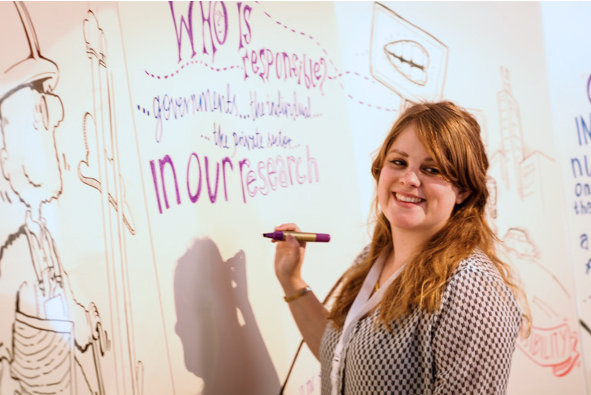 Photo: One of our graphic recorders captures content from a talk in real time. We created an infomural that wove together the output of the event into a visual story. There was a powerful narrative running through the event – the journey of young refugees, migrants and displaced persons from risk and turmoil to hope and opportunity, supported by the collective initiatives of all those represented by the event – and we wanted to bring it to life. Photo: Participants take photos of our infomural as it progresses throughout the event. As part of the event, Save the Children nominated 20 inspiring young people, all currently or in the past considered “children on the move”. These incredible young people were strong advocates for the rights of their peers, contributing music, legal aid, philanthropic support, and more to the cause. We shared their stories in visual form and were thrilled to see them respond effusively, laughing and taking photos of each other. Photo: Youth participant and singer-songwriter Bahajt Alturjman poses in front of his portrait and personal story. It was a pleasure to collaborate with Save the Children and we were inspired by the stories we captured during the event. The strength and positivity that was generated during the two days of talks and workshops is much needed. There is a lot of work to be done but huge hope for the future. This year, TED celebrates 30 years of ideas worth spreading, and we were very excited to be a part of ‘The Next Chapter’ in Vancouver. As expected, TED didn’t disappoint, delivering a 5 day schedule packed with inspirational, engaging and thought-provoking content. In case you haven’t had a chance to watch any of it yet we’ve summarised some key takeaways below, the full videos (as they are released) can all be found on TED.com. As technology advances and it gets smaller, faster and better, people are working on combining biology with technology – with extraordinary outcomes. One of these people is Hugh Herr, who describes a future where humans will no longer be limited by their infrastructure as bionic limbs and exoskeletons enable us to transcend disability and push our limits. While Herr develops the physical nature of the human body, Ray Kurzweil looks ahead to the day when, using nanobots we will be able to access the cloud straight from our brain. Gone will be the days of running out of things to say, as Kurzweil explains; our thinking will become a hybrid of biological and non-biological thinking. Whilst both exciting and frightening, one thing is for sure: technology is set to revolutionise the way we live, think, and interact. 2. Our identity has never been more important. In this age of access and connectivity, it’s easy to forget that there are better ways to use the Internet than you-tubing cats stuck in boxes. Sugata Mitra (winner of the 2013 TED prize) demonstrates the real power of the Internet through ‘The School in the Cloud”, which provides education to children in remote areas via Skype screens. Take a look and get involved at www.theschoolinthecloud.org. Similarly, Shai Reshef’s University of the People makes free higher education accessible to anyone with access to the Internet and a desire to learn. Built on the basis that education is a basic right and not a privilege, Reshef is helping students in 143 countries take control of their future. The impact of education for people in rural areas, in particular girls, is profound, as Ziaudden Yousafzai (aka Malala’s father) spoke of the identity and empowerment it provides them. By teaching boys to unlearn their misguided attitudes towards women, Yousafzai hopes to break the cycle and change the future. Geena Rocero also emphasised the need for education to spread acceptance and understanding in relation to gender assignment and the labels humans are assigned from birth. 3. It’s never been more important to get together. The internet and social media have both had a huge impact on the ways in which people connect and socialise virtually but Amanda Burden recognises the need to still provide public spaces that bring people in cities physically together. As a city planner Burden had the opportunity to help shape the city and provide green, outdoor spaces that helped build a sense of community and togetherness and help people interact and engage both with each other and their surroundings. Similarly, Bran Ferren recognises the need for people to experience and appreciate the natural and design wonders of our world and civilization, away from technology. He further explains that in our increasingly tech-dependent world, we need to understand that art and design are what makes humanity special and a way of communicating ideas and bridging knowledge. 5. We’re getting to know the unknown unknowns, but many will probably remain unknown. Despite all the advances in technology, there is much we still don’t know. As Adam Allans explains, while we know how the universe began and how it might end, we don’t know (and probably never will) what happens in black holes. However, Andrew Connelly introduced us to the LSST (the Large Synoptic Survey Telescope), a piece of extraordinary technology that is so powerful that nobody knows what they’re going to discover with it. One image from it is the equivalent of 300 images from the hubble telescope, and promises to produce new and unknown answers to our evolution and the universe. From the very, very big, to the miniscule, Rob Knight educated us on the importance of microbes and their responsibility for whether mosquitoes think we’re tasty, or how pills will affect our heart. However, as we have around 100 trillion microbial cells, there is still a long way to go before we fully understand the role they play. And if you’ve ever wandered where your internal dialogue came from and why it won’t stop giving you a hard time, then unfortunately we still don’t have the answer. David Chalmer explains that while it’s so directly experienced by all of us, it is one of the universes biggest phenomenons. As a philosopher he questions why we have it, whether it’s universal and whether we should eat something that has it… There are no answers yet, but maybe one day! 6. Managing ourselves and our systems is a work in progress… but is it progress? Although the invention of the Internet changed the world forever, and signalled a new era of learning, sharing and connecting, Edward Snowden (via the ‘Snow-bot’) highlighted the urgent need for conversations and debates on privacy, security and transparency within a networked and data filled world. He argued that while the NSA does great things, there needs to be more transparency in relation to the secrecy surrounding the mass surveillance they carry out. As an inter-connected world, he emphasises the importance of abiding by certain standards to avoid undermining international relationships and invading peoples’ right to privacy. In response, Richard Ledgett, the NSA’s Deputy Director accepted that whilst important to have national and international conversations on security and privacy, Snowden’s approach puts people at risk. He argues that whilst people do have a right to privacy, there are considerable risks from terrorist and cyber attacks and that surveillance is designed to protect the people. Ledgett urged people to learn the facts and look at the data before forming conclusions. Whether or not you believe Snowden’s actions were right, there is little doubt that they have brought about one of the most valuable and significant conversations on the issues of privacy and security within a technological world. After all, who’s watching who? This week, Innovation Arts attended the Annual HR Directors Business Summit in Birmingham. We were invited to ‘live scribe’ some of the inspirational talks from leading experts, with topics covering everything from discovering goldmines of talent to the role of robots in the future HR world! Scribing is a way of capturing complex conversations and discussions graphically (using huge whiteboards and very talented scribes’). Capturing information in this way brings a highly visual element to your meetings and conferences, and can really help bring your organisation’s most complex ideas, conversations or processes to life. 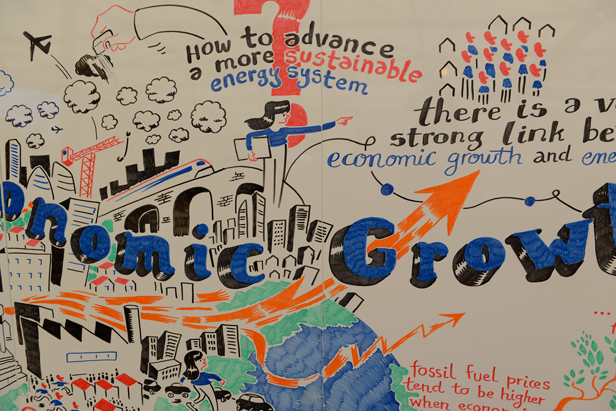 Alongside this, our scribes spent two days creating a ‘knowledge wall’ which visually communicated key insights from the talks that took place throughout the Summit. (See Fernanda and Eddie with the final outcome above). We also introduced our new values and behaviours game; Dilemma™. The summit brings together 1000 Directors and Industry Professionals so it was a fantastic opportunity for us to demonstrate the new game. Gamification is such a current engagement theme and the enthusiasm at the event definitely proved this. 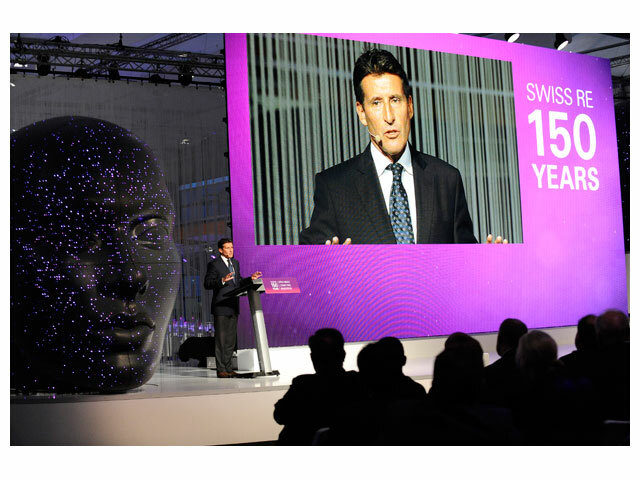 The dialogue started in Zurich and continued in London for Swiss Re’s 150 Anniversary at the Olympic Park. Our scribing from the previous event acted as a springboard for the conversations to be had over the weekend. Keynote speaker, Lord Sebastian Coe, provided a fascinating insight into the risks associated with the London 2012 Games. We recently got back from the launch event of Swiss Re’s 150 Years Anniversary in Zurich, where we scribed a series of dialogue sessions. We captured the entire afternoon’s dialogue with our scribing team and produced a special Dialogue report. We also captured keynote speaker Peter Maurer, President of the International Committee of the Red Cross’s speech. We’re in the papers…in Mexico! We were very lucky to be invited to scribe at Foro Banorte last summer. This was an event hosted by Mexican bank Banorte that aimed to spark conversation surrounding the growth of the Bajio region of Mexico. 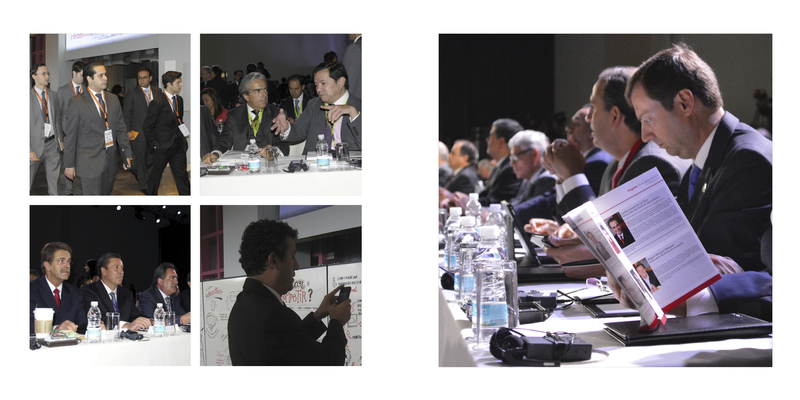 Speakers included governors of the states of Aguascalientes, Guanajuato and San Luis, ministers of Economy and Taxes as well as ex-president of Colombia Cesar Gaviria and former mayor of New York Rudy Giuliani. Conversation topics ranged from education to tax reforms, cooperation to competition. And we were there, visually capturing it all. 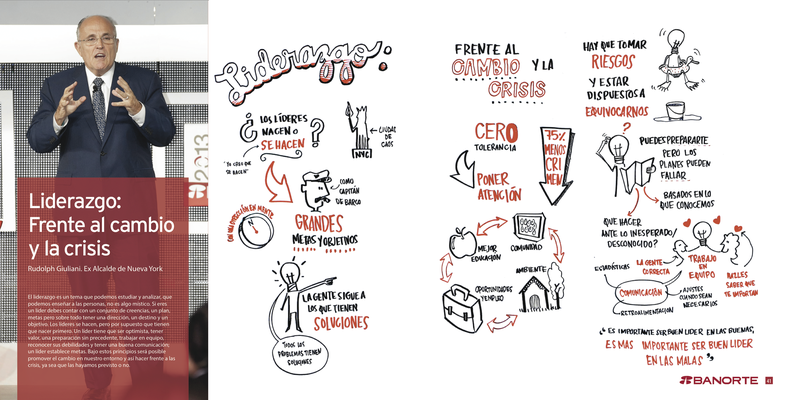 It was a multi-cultural challenge; we had a Canadian scribe capturing in Spanish, a Mexican scribe who learned to scribe in English and at some point we were listening to keynote speeches in English and translating them to Spanish as we scribed! It was great to see participants coming up to the WorkWalls to see how ideas were coming together in a really visual and interesting way. We even made it to the front page of the business section of Mexican newspaper Reforma!